As I write this, Jon and I are sitting at the Keekorok Lodge's Hippo Bar in the Maasai Mara Wildlife Reserve. The bar, of course, is aptly named for the resident hippopotami population happily lounging in the muddy pond to our left. They are casually accompanied by a small crocodile, currently submerged having formerly sunned on the tiny beach. The landscape itself is, however, overshadowed at the moment by a lone adult elephant. He seems nonchalant as he meanders along the shore line munching on green grass and intermittently refreshing himself from the warming sun with sips of cool water. Much the same are our friends, the wallowing hippos, often splashing and occasionally snorting. In contrast are the herds of zebra distantly surrounding us, a few of which yammer out their distinct call frequently. It seems they are keeping the kids in line, so to speak. 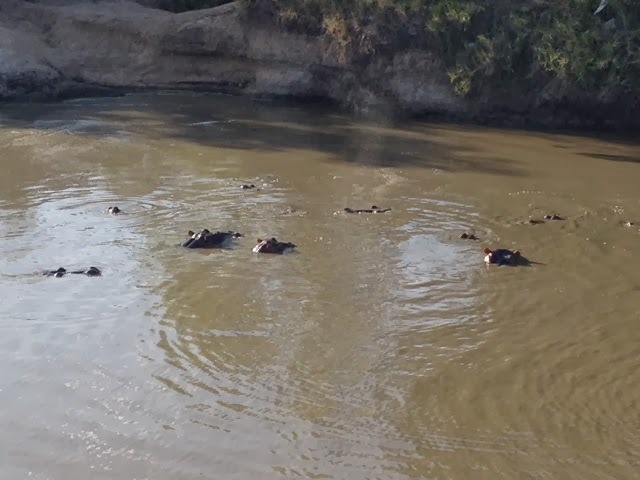 The hippos have random bouts of group grunting and sometimes stand up in the small pond, looking like rising land masses. The elephant has sauntered toward the brush now, moving nearer the zebra in his eternal quest for groceries and the storks that were previously avoiding him are spreading their wings to stand and sun along the bank. A group of Indian people stopped by, briefly to see the big game and to order a drink to go, but just now our only company is a smartly dressed bartender and a small black and white monkey relaxing in a tree by the door. Intriguingly, the little monkey has remarkably bright blue testicles, such that they surely cannot be naturally occurring. The best description I can currently offer is robin's egg blue, though I know it sounds unbelievable. These little guys roam the property, testing guests' door handles for unlocked rooms they can pillage and hissing and slapping the ground if you get to close to them. Nonetheless, we have decided to accept our mission: to ascertain whether the blue balls are natural or artificial. The execution of our plan is simple; survey the testicles of as many hotel monkeys as possible, even including digital documentation. After all, this experiment is conducted in the name of science! And so we set out from our perch at the multi-species refreshing water hole to photo log our first subject. 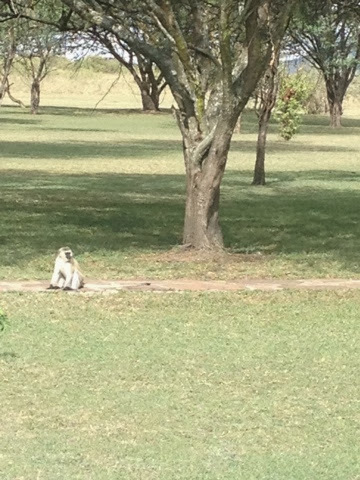 As he was casually relaxing in a tree near the Hippo Bar's exit, it was easy to approach him and snap an iPhone picture. Upon relatively close inspection, it did indeed appear that the testicles in question were not only bright blue, but also that this could actually have been Mother Nature's intention. Obviously science demands additional proof, and thus our search continued. As we sought larger sample size, it was fortunate that another mischievous primate had arrived on the deck, running lithe but lazily along the handrail. We scouted out the necessary details and discovered a second pair of blue balls. As we wandered from the deck toward the lodge, we saw several more monkeys, two of whom we're playing in a hammock hung out on the lawn in the shade. Sure enough, blue balls were a theme amongst the Y chromosome influenced monkeys, and we therefore drew our scientific conclusions before readying ourselves for one last game drive through the evening Maasai Mara.